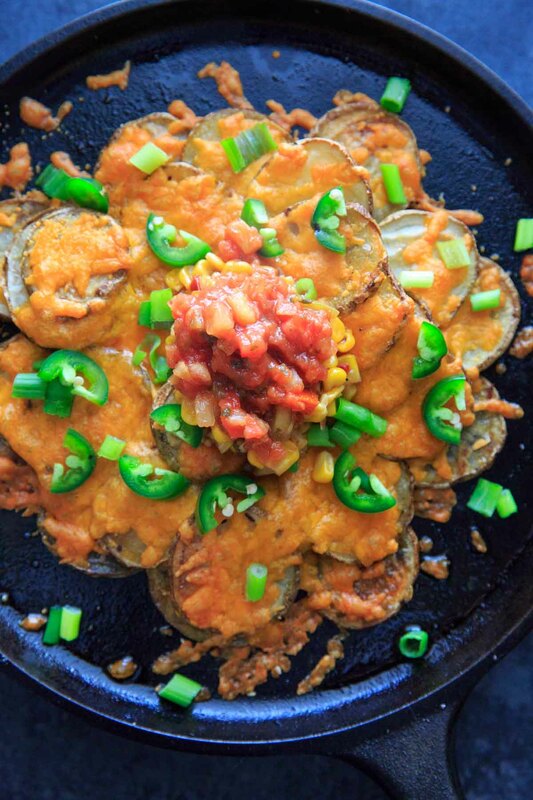 Irish Pub Potato Nachos topped with cheddar cheese and all your favorite toppings. 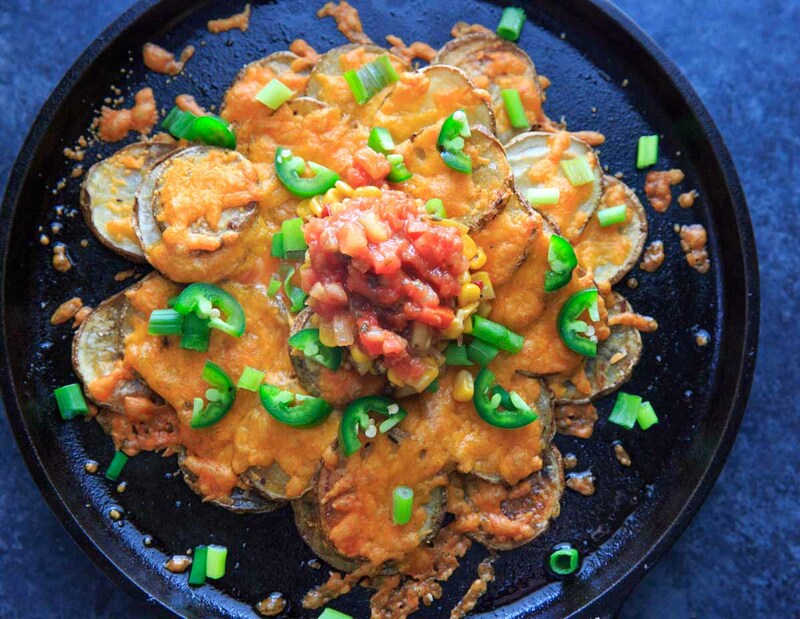 For celebrating St. Patrick’s Day or any day with a twist on this appetizer staple! 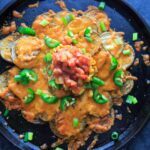 These nachos are not technically/traditionally Irish, but are a version of the appetizer available at some Irish pubs. I’ve also seen them made with potato chips or french fries! Technically we are making homemade potato chips out of potato slices today. No need to peel the potatoes if you are using organic – that’s actually where most of the nutrients come from! Potassium iron, and fiber being the most notable. But let’s be real – we’re topping them with olive oil and cheese, so I’m not pretending this is one of the healthiest meals. Let’s take the nutrients where we can get them. Roasting them in (roughly) 1/4 inch slices works well so they are sturdy enough to hold some toppings, but not too thin where they all burn. I like to add the cheese on the potatoes in a couple layers to get a more even distribution. It’s no fun to realize all the good cheese and toppings are gone after only eating the top half of your nacho plate! As far as toppings go – you can go with your favorites! I kept mine fairly minimal with green onion, jalapeno and salsas (corn AND tomato salsa FTW). I didn’t even realize I was going for a green theme! But anything that works for regular nachos would work here! You could even shape it like a shamrock if you’re artistically inclined! I didn’t think of this until I was editing the photos, but that could be super cute. Let’s just pretend I did that. Squint really hard it’ll look like one. 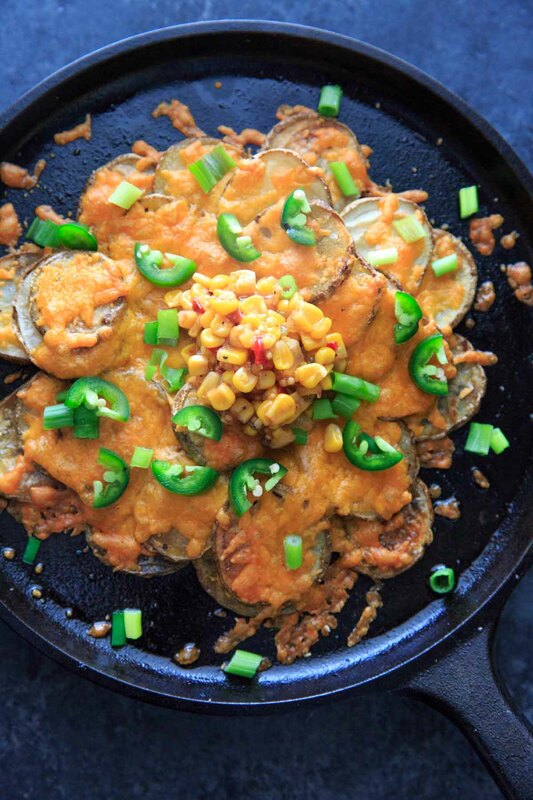 Irish Pub Style Potato Nachos topped with cheddar cheese and all your favorite toppings. 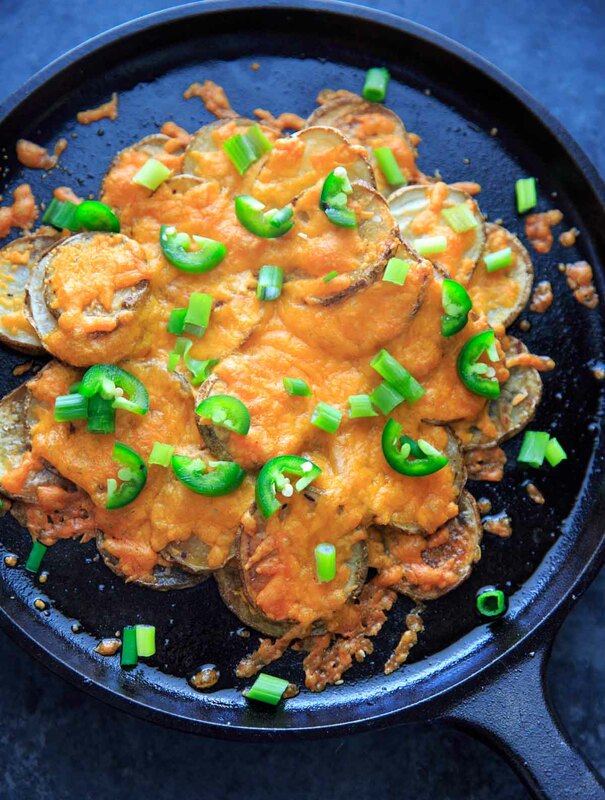 For celebrating St. Patrick's Day or any day with a twist on this appetizer staple! Wash and cut potatoes in 1/4 inch slices. Lay slices on a baking sheet and drizzle with olive oil, salt and pepper, making sure both sides are covered. 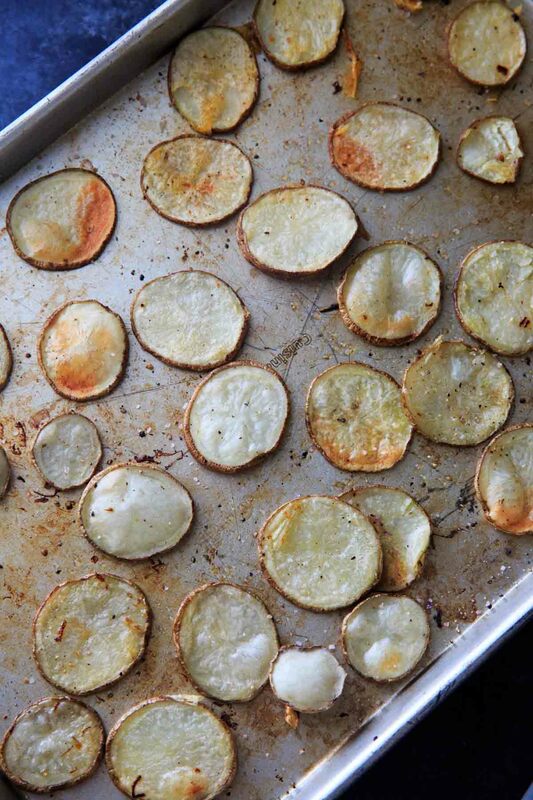 Bake potato slices at 400°F for 10 minutes, flip pieces over and bake another 10-15 minutes until lightly browned. Let cool slightly. 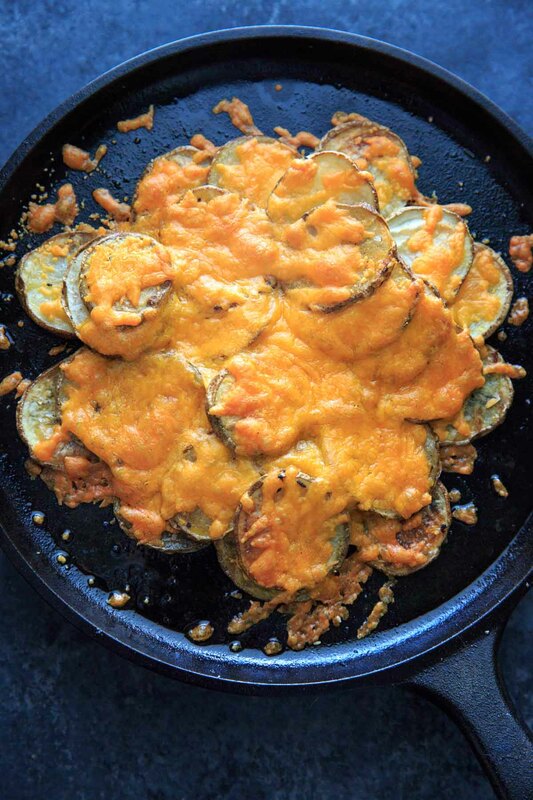 Arrange half of potato slices on baking sheet or cast iron in a pile (nacho style) and top with 1/2 cup of the cheese. Top with remaining potato slices and the remaining 1/2 cup cheese. Bake at 400°F for an additional 10 minutes or until cheese is melted. Add toppings as desired and serve! *I used chopped green onion, diced jalapeno, corn salsa and tomato salsa as my toppings. I just stumbled upon your blog from Pinterest and I am definitely adding you to my daily read. I love your writing style and your photos are amazing! Keep up the excellent work. Are there any recipes you’d recommend I try? Any favourites perhaps from your early years? Thanks so much Amanda! A good place to start is the “popular” list: https://www.trialandeater.com/recipes/popular/ Grandma’s Ziti is always a favorite as well as Nana’s Easter Bread if you’re looking for a holiday recipe!